Veris Limited (VRS: ASX announced another acquisition in its continuing strategy to rollup firms in the surveying and urban/regional planning business. Veris decided to wind down its old OTOC construction business over last 18 months to focus on its surveying and planning strategy. The new acquisition was well received with the stock moving up 18% on the news. Veris appear well placed to service the plethora of east coast infrastructure projects over the next few years and to me, it looks interesting. SmartPay Holdings (SMP: ASX) provide payment solutions for merchants via eftpos terminals announced a partnership with China’s AliPay which allows Alipay customers to transact in Australian & New Zealand so long as the merchant has a SmartPay terminal. SmartPay currently has in excess of 5,000 terminals in the market. Given the rise of Chinese tourists and business people to both Australia and NZ, this partnership represents a good opportunity to capture some of the transaction fees associated with their spending and help grow SmartPay’s revenues. The market cheered the announcement with the stock price rising from 14c a share to 22c share on the day and has since stabilised at around the 20c share level. Data#3 Limited (DTL: ASX) announced that it had won the tender to be the sole provider to the Australian Commonwealth Government for Microsoft Licensing Solutions. This represents a significant coup for the company as the tender allowed for multiple providers but The Digital Transformation Agency acting on behalf of the Commonwealth elected to have Data#3 as the sole provider. It is a strong vote of confidence in Data#3 prior work on behalf of the government and their ability to execute on the requirements of this latest tender. The tender should provide a steady stream of work for Data#3 over the coming years. Locality Planning Energy (LPE: ASX) announced that it had secured $10mil in debt funding in order to fully fund and accelerate their rollout out of electricity meters into strata buildings. This funding covers all their capital infrastructure requirements for the current business plan which runs up to 2021. The company has been signalling this debt funding for some time. Now, that it is in place, LPE should avoid the need for a future capital raising in order to fund the capex associated with their growth. I have previously highlighted the debt funding for LPE as being a key milestone for the company, which has now come to fruition. The Top performing IPO’s of 2017 are listed in the table below along with their returns through the end of 2017. It is interesting to note that out of the top 10 IPO’s, 9 were microcaps based on the implied IPO listing market capitalisation. There were 113 new listings on the ASX in 2017 which was up from 96 listings in 2016. A staggering statistic from last year’s IPO’s was that IPO’ under $50mil market cap produced an average return of 69.8% to the end of Dec 31stversus an average return for IPO’s over $50mil market cap of 23.5%. Most fund managers define a microcap as anything under $300mil market cap and of the 113 IPO’s in 2017 no fewer than 101 of these IPO’s were under $300mil market cap at listing. The financial sector raised the most capital but the material sector had the largest numbers of raisings by volume with 35. Even though the financial sector raised the most capital due in large to part to hefty raisings like Netwealth Group, Moelis Australia and Magellan Global. The financial sector failed to have one IPO represented in the Top 10 performing IPO’s of 2017. Fund manager Microequities Asset Management have announced their intention to IPO their fund management business. The company is looking to raise $19m giving it a market capitalisation of $106m on listing. The company currently has asset under management of $442m. Asset under management has grown from $38mil when the first fund was launched back in 2009. The firm has a long track record in managing microcaps and has delivered some excellent returns. The proposed listing on April 30th would make the Mircoequities Asset Management business a microcap stock in its own right. I guess the pertinent question is will any of the Microequities underlying funds buy a stake in this newly listed microcap asset manager? We tally up the performance of all the Australian microcap funds in our quarterly microcap fund performance review. As part of this new monthly newsletter, we will pick out one microcap fund and give a quick snapshot of the fund along with one stock that looks interesting currently from the fund’s portfolio. Our inaugural microcap fund snapshot is of The Perennial Microcap Opportunities Trust. Perennial Value Management should be a name familiar to many Australian investors given their long track record in funds management. As the name implies they are unashamedly value managers at their core and the Perennial Microcap Opportunities Trust follows a value philosophy. Having successfully run a small cap fund for many years, Perennial launched a dedicated microcap fund in February 2017 to complement their small-cap offering. Given the solid track record of the Perennial small cap team, anyone who would have backed them in the new microcap offering would have been rewarded handsomely. The fund recently celebrated its 1 year anniversary and was up 50.0% for the first year net of all fees. A truly stellar result by any, absolute or relative measure and the fund handily outperformed its benchmark. The current size of the fund is $22mil and it charges a 1.2% management fee and a 15% performance fee over its benchmark. 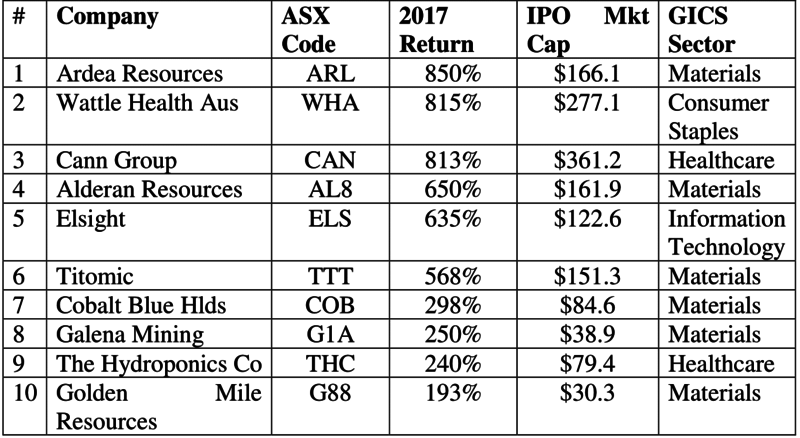 I asked Andrew Smith Head of Small & Microcaps at Perennial what was one of the more interesting stocks from the current microcap portfolio and he highlighted Austin Engineering (ANG: ASX). Austin makes highly engineered truck trays for the mining industry with most products customised to maximise tonnage at each mine. Valuation: The stock is on 12x PE and 9x EV/EBIT in FY19 on Perennials numbers. The share price has tracked sideways despite a strong result in February 2018 which saw them deliver $12.2m EBITDA (ahead of guidance of $10-12m). The successful turnaround of Austin is being led by a new management team with a history of success in their previous roles. Chairman Jim Walker is ex Westrac and MD Peter Forsyth is ex Caterpillar. Balance sheet de-gearing: Debt should start reducing materially now working capital has normalised, Perennial forecast debt to drop to 0.6x Net Debt/EBITDA. Product Cycle: Truck tray sales peaked for ANG in 2012 and 2013, there is a 5-6 year design life for each tray. Thus, the replacement cycle for these old trays should start to flow through to earnings in FY18 and FY19. Assuming the majority of ANG’s customers re-order which Perennial thinks is likely given strong iron ore and coal production volumes in response to recovering prices over the last 2 years. Perennial view ANG as a turnaround story which has already delivered two strong halves of improved profitability and has the benefit of a strong tailwind in the form of a recovering mining sector.